As Mercury is slowing its pace to go retrograde at 3:49 am Monday morning — giving us some time to reflect and assimilate the rapid shifts we’ve been feeling since the Full Moon last Thursday — I thought I’d speak a little about what is going on in the skies so you can share in my excitement. I hope many of you are continuing to watch the sky at sunset as Venus is being drawn into her alignment with Jupiter — closer and closer each night. 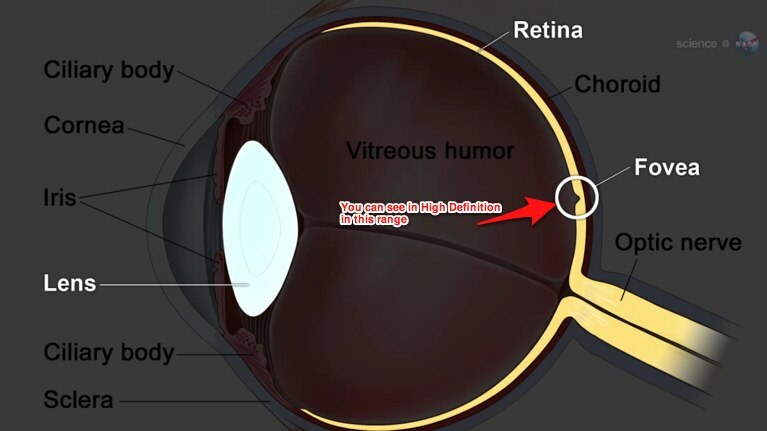 By the sheer optics of our retina possessing a patch of tissue named the “Fovea” — which has densely packed cones at its center — we get to see Venus and Jupiter converging in the sky in our own body’s naturally designed “High Definition.” This is because Venus and Jupiter are only 3 degrees apart and near enough to get the brain’s attention to focus the retina in this narrow channel. This diagram made me think of how Venus and Jupiter will look in relationship to one another in the sky on Monday night, just after sunset. Venus will then move throughout the evening to be in “exact” conjoinment with Jupiter (and out of our view as they set around 10 pm on the western horizon and retreat to their boudoir behind the cloaked doors of night). If you look closely below, you will also see the backdrop of stars in the constellation of Aries. 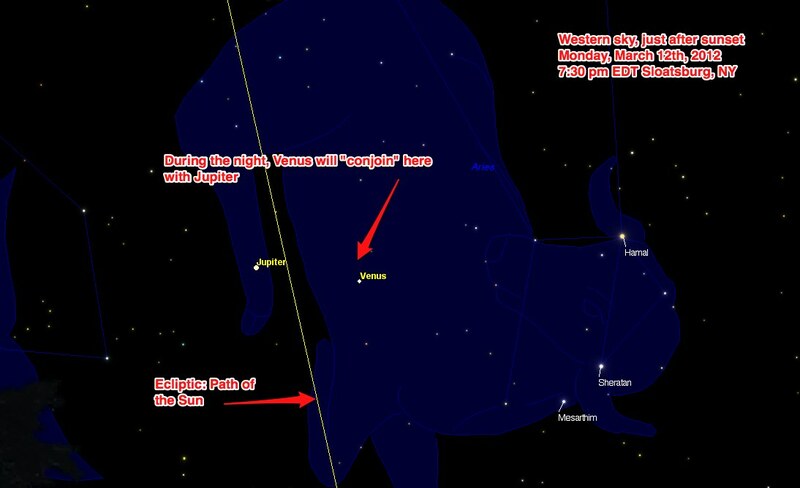 The outline drawn of this constellation might also suggest how the star Hamal has the perfect “High Definition” angle, as well, for viewing Venus and Jupiter’s special exchange. 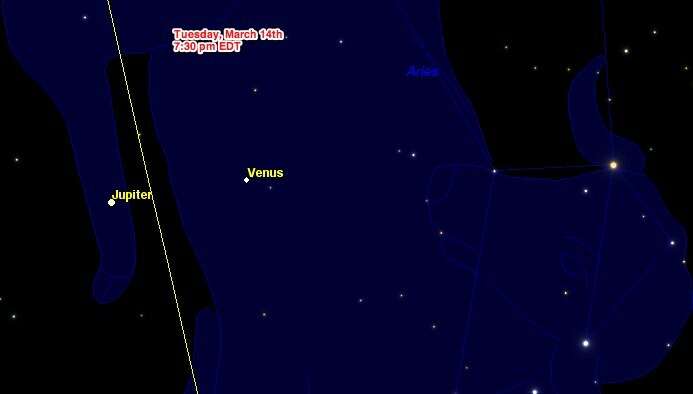 This illustrates how far Venus moves within 24 hours. So, with this spectacular show in the night sky for all around the world — and the heavens — to clearly see, it makes me wonder about the activation of Spring and its current astrological association with the zodiacal sign Aries. Realize that, prior to 0 B.C., everyone on Earth was in agreement every 2000 years as to which “quality” each sign in the zodiac would now shift to. Each sign would take turns, like rotating spokes in a wheel. So one could then reason that, by this same manipulation of the combination, Aries would now be a “fixed” sign and the sign of Taurus would be now be mutable. It also makes me wonder how the “combination of cardinal points” was manipulated in the past and that for thousands of years, there was agreement about the shifting qualities of astrological signs. Perhaps Venus is helping us to see in “high definition” what might be possible for us to initiate and to help us clarify our own understanding of these over-manipulated Arian mythological forces in our lives now. Venus, the planetary negotiator, is in dialog with Jupiter, the planet who incites us to expand our belief systems and dare to venture forth where none have gone before. Aries is a fire sign and the primary force of new initiatives and is the sign of pioneers and combatants. The Egyptians were the supporters and creators of the cult of Aries and the triumphant road at the temple of Karnak is lined with sphinxes bearing the heads of Aries the Ram. Now that the planet Neptune has moved into its ruling sign of Pisces for the next 13 years, will this be the time we begin to align with Pisces as a Cardinal and initiatic force each year at the time of equal day and night? And since Pisces is the sign that allows for us to drift through change with a high degree of sensitivity to “outside influences”, its receptive and intuitive qualities are also those that we find in the Alternate Reality within our ecstatic ritual trance journey postures at the time of the season changes. With both Mars and Mercury in retrograde motion as we approach the Equinox this year, I encourage you to take some time this week to tune in and prepare 3 Spring intentions for the coming year so that you can charge them at the Spring Equinox. Meanwhile, I will also contemplate and select the posture to guide us in our awakening the energy of Spring together on Tuesday, March 20th at 7 pm. I will email you later this week with more details on the Equinox as well as the Aries New Moon posture selections so reserve a space in your calendars for our group posture gathering or your remote participation.